My father in law posted elsewhere that he was going to see Little Shop of Horrors performed by 7th House Theater (Facebook link) at the Open Eye Figure Theatre (not too far from MIA). 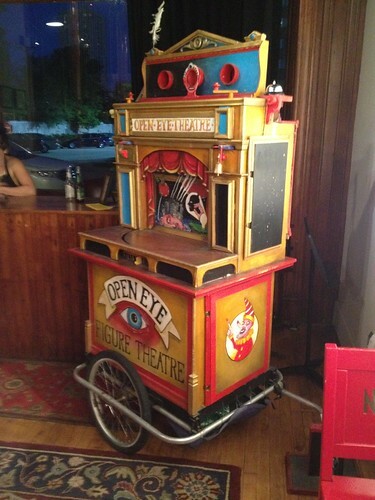 Open Eye does a lot of puppet shows - they have a driveway series - and there's a cool bicycle-pulled puppet theater in their entry way (below). 7th House doesn't have a permanent location - there are only 7 members - so Open Eye was providing the venue. I didn't know what to expect, but from the very first note it was amazing (I think that was Liz Hawkinson who kicked it off). Everyone was an exceptional singer, and that was the focus of the play. Some of the details were left to the imagination with some small visual aids (I don't want to spoil those parts) and it worked amazingly well. The three background singers played many of the parts and when a part was minor, like Mr. Mushnik, players swapped the role with a small overlap in delivery to indicate ownership was passing to someone else (as well as handing around a mustache). 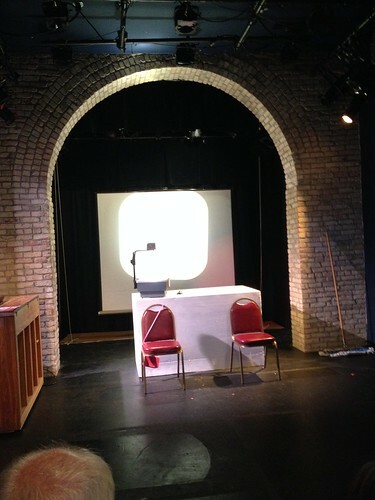 There was live piano and guitar and the pianist (Robert Frost) and guitarist (David Darrow) joined in the play. David Darrow played a convincing psychopath DDS. Maeve Moynihan did an amazing Audrey, and in the small Open Eye venue, her voice was everywhere. Eryn (not in the play) got a treat in that Catherine W Noble was her teacher at the Children's Theater Company Percy Jackson acting class. We had no idea she would be there and she remembered Eryn when we caught up with her after the play. If I had any thought that Eryn might not be a theater geek despite initial interest, this weekend probably seals the deal for her between 7th House and the Centennial Showboat. Grant Sorenson was Seymour (I really hadn't realized until last night that the character from Little Shop of Horrors might have something to do with the Krelborns from Malcolm in the Middle) and Gracie Kay Anderson was one of the three Ronette's with Catherine and Liz. Both were just as solid as the rest of the cast. I'm looking forward to seeing more of them in the future. Waiting for Little Shop to start. The props and scenery didn't get much more elaborate than what you see, a plastic mustache on a stick, a plastic tarp, and a clever Audrey 2. This should give you some idea of how close we were to the actors when they were down stage (I got that right - from the audience perspective, down stage is closest to me, upstage is back by the screen).